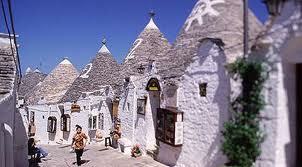 Puglia, the home of Primitivo, is one of Italy’s poorest regions. Italy has big regional differences in terms of culture and economy, and although Puglia is at the wrong end of the scale when it comes to the money side of things, it makes up for it in terms of its food and drink. It really should be much more of a “place to go” for tourists than it is. The Italians flock there in droves during the summer. They know where you can get baking heat, wonderful seafood mixed with plenty of North African influences, and some of the most interesting red wines that Italy has on offer. Primitivo is right up there. Big thing about Puglia is that, outside of the DOC regions, the vineyard areas cope with a lot. You get lots of IGT wine (Italy’s version of Vin de Pays), which is not part of any higher DOC/DOCG bands, but can still deliver good wines. It’s flat, hot, and packed with cheap labour. This should be where Italy produces bucket loads of good quality supermarket standards. They’re not quite near potential yet, for many reasons that might get me into trouble if I go into online! Luckily for us these issues haven’t stopped them growing the local grapes in the best areas they can: Negroamaro, Malvasia Nera, and, our NWTW, Primitivo. no way!! definitely learned my lesson! I’ve experienced a big differences in primitivo. Some are wonderful and other barely drinkable. I guess that would be true of any wine though.